AUD 5,455 Excl. Duties / Taxes. This Heart diamond is 1.79 carat in weight, and comes with Very Good polish and Good symmetry, as verified from an independent gemological laboratory. The diamond is graded Z in colour, and has a clarity grade of SI2. The diamond's GIA grading report number is 2155306228, which will detail further its specifications and measurements, and will also come with the purchase of the stone. AUD 22,911 Excl. Duties / Taxes. This Heart diamond is 4 carat in weight, and comes with Very Good polish and Good symmetry, as verified from an independent gemological laboratory. The diamond is graded W in colour, and has a clarity grade of SI1. The diamond's GIA grading report number is 2217120844, which will detail further its specifications and measurements, and will also come with the purchase of the stone. AUD 30,541 Excl. Duties / Taxes. This Heart diamond is 5.03 carat in weight, and comes with Very Good polish and Very Good symmetry, as verified from an independent gemological laboratory. The diamond is graded U in colour, and has a clarity grade of SI2. The diamond's GIA grading report number is 2287759126, which will detail further its specifications and measurements, and will also come with the purchase of the stone. AUD 7,135 Excl. Duties / Taxes. This Heart diamond is 1.51 carat in weight, and comes with Very Good polish and Good symmetry, as verified from an independent gemological laboratory. The diamond is graded Y in colour, and has a clarity grade of SI1. The diamond's GIA grading report number is 2175337407, which will detail further its specifications and measurements, and will also come with the purchase of the stone. AUD 15,793 Excl. Duties / Taxes. This Heart diamond is 3.1 carat in weight, and comes with Excellent polish and Very Good symmetry, as verified from an independent gemological laboratory. The diamond is graded U in colour, and has a clarity grade of VS1. The diamond's GIA grading report number is 2195126229, which will detail further its specifications and measurements, and will also come with the purchase of the stone. AUD 52,824 Excl. Duties / Taxes. This Heart diamond is 6.23 carat in weight, and comes with Excellent polish and Good symmetry, as verified from an independent gemological laboratory. The diamond is graded W in colour, and has a clarity grade of VS2. The diamond's GIA grading report number is 2191217134, which will detail further its specifications and measurements, and will also come with the purchase of the stone. This Heart diamond is 1.55 carat in weight, and comes with Very Good polish and Very Good symmetry, as verified from an independent gemological laboratory. The diamond is graded W in colour, and has a clarity grade of VVS2. The diamond's GIA grading report number is 2324182679, which will detail further its specifications and measurements, and will also come with the purchase of the stone. AUD 8,226 Excl. Duties / Taxes. This Heart diamond is 2.15 carat in weight, and comes with Very Good polish and Good symmetry, as verified from an independent gemological laboratory. The diamond is graded U in colour, and has a clarity grade of VS2. The diamond's GIA grading report number is 5191965460, which will detail further its specifications and measurements, and will also come with the purchase of the stone. AUD 12,818 Excl. Duties / Taxes. 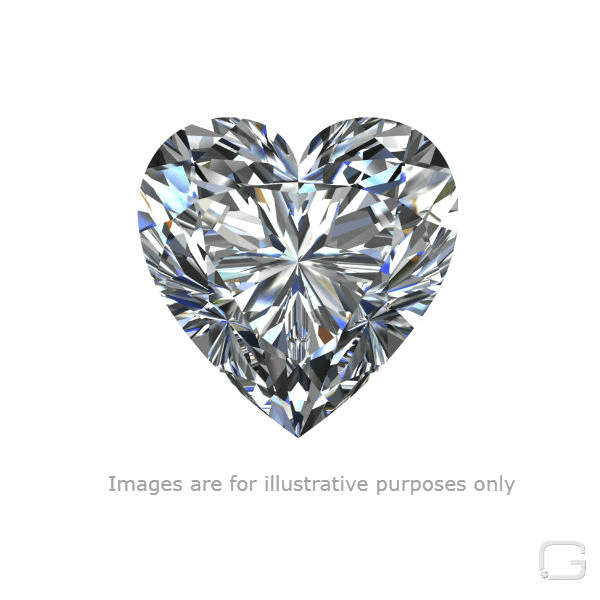 This Heart diamond is 1.81 carat in weight, and comes with Excellent polish and Good symmetry, as verified from an independent gemological laboratory. The diamond is graded Y in colour, and has a clarity grade of VS1. The diamond's GIA grading report number is 5181728524, which will detail further its specifications and measurements, and will also come with the purchase of the stone. AUD 1,17,821 Excl. Duties / Taxes. This Heart diamond is 7.06 carat in weight, and comes with Very Good polish and Very Good symmetry, as verified from an independent gemological laboratory. The diamond is graded Y in colour, and has a clarity grade of VS2. The diamond's GIA grading report number is 5172408986, which will detail further its specifications and measurements, and will also come with the purchase of the stone. This Heart diamond is 1.01 carat in weight, and comes with Good polish and Good symmetry, as verified from an independent gemological laboratory. The diamond is graded O in colour, and has a clarity grade of SI1. The diamond's GIA grading report number is 2141673695, which will detail further its specifications and measurements, and will also come with the purchase of the stone. This Heart diamond is 0.9 carat in weight, and comes with Excellent polish and Very Good symmetry, as verified from an independent gemological laboratory. The diamond is graded W in colour, and has a clarity grade of VS2. The diamond's GIA grading report number is 2171674399, which will detail further its specifications and measurements, and will also come with the purchase of the stone. AUD 36,805 Excl. Duties / Taxes. This Heart diamond is 5.05 carat in weight, and comes with Excellent polish and Very Good symmetry, as verified from an independent gemological laboratory. The diamond is graded S in colour, and has a clarity grade of SI1. The diamond's GIA grading report number is 2306162139, which will detail further its specifications and measurements, and will also come with the purchase of the stone. AUD 7,430 Excl. Duties / Taxes. This Heart diamond is 2.01 carat in weight, and comes with Very Good polish and Good symmetry, as verified from an independent gemological laboratory. The diamond is graded Y in colour, and has a clarity grade of SI1. The diamond's GIA grading report number is 1192284819, which will detail further its specifications and measurements, and will also come with the purchase of the stone. This Heart diamond is 1.43 carat in weight, and comes with Good polish and Very Good symmetry, as verified from an independent gemological laboratory. The diamond is graded S in colour, and has a clarity grade of VS2. The diamond's GIA grading report number is 2205125273, which will detail further its specifications and measurements, and will also come with the purchase of the stone. This Heart diamond is 2.52 carat in weight, and comes with Very Good polish and Good symmetry, as verified from an independent gemological laboratory. The diamond is graded U in colour, and has a clarity grade of SI1. The diamond's GIA grading report number is 2165416006, which will detail further its specifications and measurements, and will also come with the purchase of the stone.